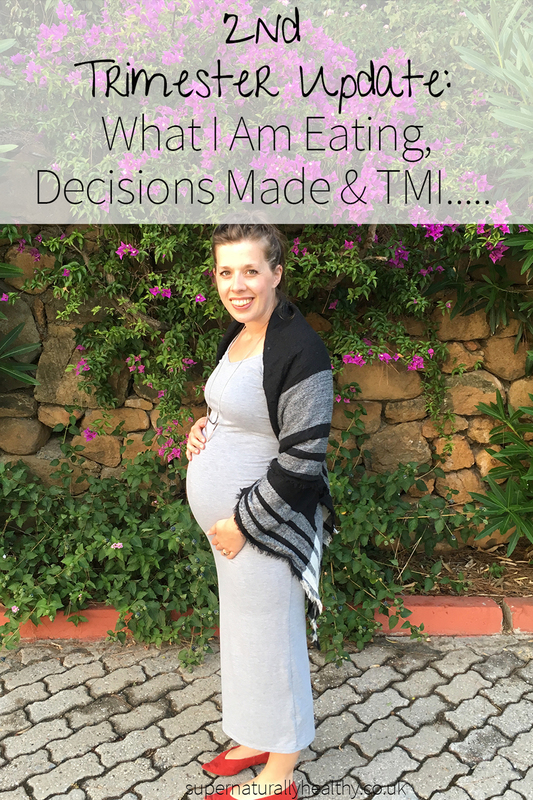 2nd Trimester Update: What I Am Eating, Decisions Made & TMI….. In this post, I am going to cover what I am eating, how I’ve been feeling and there will definitely be elements of TMI and actual real-life feelings as that’s how I roll. You ready? Well, our 20-week scan told us we are having a…….BOY. I can’t wait to see what a mini Joe looks like! So is you may know my first trimester was grim, to say the least. It was like having the flu for 4 months solid (minus the temperature) and it went on for ages. I was still feeling pretty awful right up until 20 weeks. But have been slowly making progress and feeling less nauseous over time. I have to say in the last 3 ish week I have been feeling the most ‘normal’ I have felt in a while and constant nausea seems to have eased. I have even started to feel a bit of a pregnancy glow! Vomiting – not vomited for a lonnnnnnnngggg time now – praise the lord! Constipation – this is still a bit on and off but if I keep up with lots of fruit and veggies, my probiotics, magnesium, and stool to squat on while I poop, it’s all good. Mild Fatigue – I am definitely more tired but it’s not too bad and most of the time I just need to sit for 30 mins and do nothing and then recuperate pretty quickly. I am in bed by 9pm most nights and sleep in til 7.30 so I am getting lots of sleep and haven’t really found the whole tired thing a big deal. Back and hip pain – this has been a new and unwelcome issue. My hips and back have always been a bit buggared but it has steadily gotten worse and is painful to walk and lie down (although has gotten slightly better post week 26). BUT with the help of a chiropractor its a lot more manageable. The 20-week scan was pretty cool. I was contemplating having no scans at all due to the EMF of them but I decided against it and am glad I did. I didn’t realise how anxious I was about the baby not having a proper heart or arm or eye or something and having a wee nosey at it 4 heart chambers, kidneys and limbs did me so much good. Figuring out what ‘kicks felt like! It took me a while to really feel them but I was sitting on a train right watching Graham Norton when I first noticed my belly change shape and baby kicks. Since then he has been kicking none stop! Getting a belly. I have always carried extra ‘weight’ around my thighs and so having a growing belly is awesome and also totally weird. I keep of catching myself in reflections and being like ‘who is that? !” I thought I would freak out more about gaining weight and feeling like I am becoming huge, but other than feeling like the width of my arse and thighs has doubled in size, I seem to be ok with the change of shape for now. Ohhh and buying maternity jeans! They are so comfy I am not sure I will ever wear trousers with a zip and buttons ever again ….thanks H&M! Despite its aches and pains, I am grateful for my body in this process. It is sustaining an entirely unique human being with no conscious input from me – it’s phenomenal. My home. I have officially opted for a home birth (if all goes well with rest of pregnancy) so I am grateful for our house with the space to have our family, use a birthing pool and stare into the fields. I am such a visual and sensitive person, I know that being in a calm safe place will help me to stay calm and I am so grateful that my home is that place. Food has been SO much more enjoyable this trimester. The first trimester I ate to stop me puking and wanting to pass out – now I can eat and mainly enjoy things again. I have been able to make more foods from scratch like buckwheat bread, cookies, nut milk and even wanted to eat sardines – YAY! Food is such an important thing in my life and something I place a high value on, so being able to eat more normally has helped me feel like myself again. I still eat every few hours and am focusing on nutrient-rich foods, but also just going with the flow of what I feel. >> Fruit – even more than before especially berries, oranges and apples. I have been making lots of carrot and ginger juice with an orange added and that’s been helping when I feel super sick later in the day. >> Gluten-free grains – I have eased up on these as I have been focusing on more blood sugar stabilising foods with fat and protein. But still loving me some porridge topped with peanut butter and maple syrup! 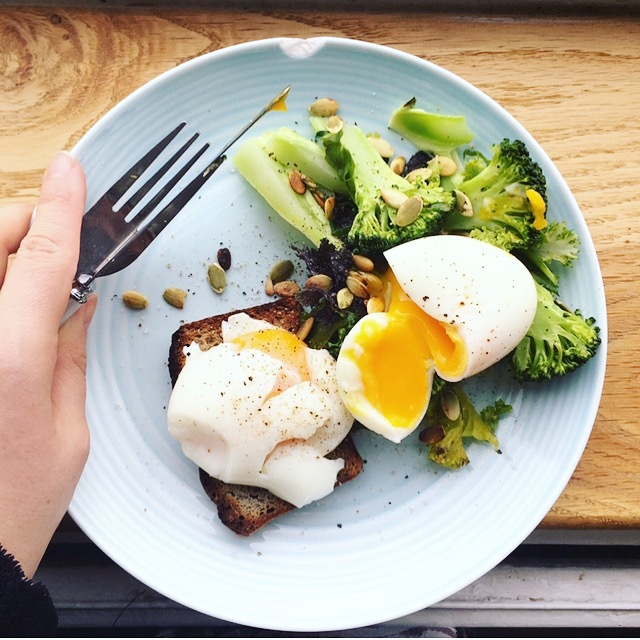 >> Eggs – I didn’t go off eggs totally but am back to eating them daily again mainly in a boiled or poached egg fashion and ALWAYS with a runny yolk – yum. >> Sardines – I knew I was feeling better when I actually wanted to eat sardines! Tinned sardines are a great and cheap source of nutrients – especially calcium, omega 3 fatty acids and protein – they really are a pregnancy (and beyond) superfood. >> Broccoli & cooked kale – I eat it most days and am loving it because it’s a great source of folate and fibre. >> Home-made ice cream – I have been wanting more dessert type things and my instant iced cream is going down very well…..
>> Peanut/almond/sunflower butter – pretty much any type of nut or seed butter. >> Cookies – that is how this recipe was born and I have probably made about 5+ batches of these in the last 3 weeks…. >> Buckwheat toast – ideally topped with sugar-free jam and almond butter or mashed banana or mashed avocado. >> Cookie Dough & Cookies – I have eaten a LOT of these. In both the cooked and dough form. >> Juice – I have been craving more juice type things. Back in the day, I LOVED cordial and squash so instead, I have been buying some tart cherry juice extract (which has been shown to help with joints, reduce inflammation and help in melatonin production) and diluting that instead and that has been doing the trick! >> Prawns – I have definitely had a bit of a thing for prawns….not sure how awesome this is as lots of prawns can be poorly sourced but hey ho. Overall I think my sweet cravings have increased (I actually didn’t want many sweet things in the first trimester) but nothing crazy and I am meeting them with more naturally sweet options (want my go-to recipes then grab your eguide below). >> Dairy – I have been really craving cheese and butter and milk and eating them more and thinking all was dandy. But then I started to get eczema on my face and I KNOW that for me dairy is linked to eczema. So about a week ago I removed it, except for my homemade ghee and goat cheese so I can still get some of the fat-soluble nutrients, and what do ya know my skin has nearly all cleared up…. >> Gluten – I was having small amounts of this in the 1st trimester but with all the pain from my wrist, hip and back I felt that this could be contributing to the ongoing inflammation. So I am avoiding it entirely again which is no big deal for me as I have been gluten free for ohhhhhhh 6 years now and have mainly been eating lots of buckwheat toast instead. >> Alcohol – I still just don’t really fancy it, but if I go start do I will have a small glass of wine or G&T but generally it’s not something I fancy. >> Avoiding egg yolks – I deliberately make my eggs runny and boil my eggs so they are soft. >> Buying millions of things for baby – I am hoping to get away with buying very little for this baby. I have thankfully been given lots of maternity clothes and will beg and borrow things like a pram, car seat and wrap etc. The only things I think we will buy new are maybe a cot that will turn into a toddler bed – otherwise, I will bay or gumtree anything we need. Confession – I have mainly been spending money on myself!! With regular chiropractor appointments and acupuncture and even higher standards of what I am eating yet with less energy to make it – my money is mainly going on me! But I am totally ok with that…. Home birth – I have spent some time thinking about this but knowing myself, my history and my strengths and weakness, I think my body will feel safest at home. Birth is based on one big hormonal cascade and stress/fear hormones can get in the way of ‘birthing hormones’ doing their job as effectively. I hate confrontation and am super sensitive so the idea of being in a location surround by lots of people, other birthing mommas, nurses, doctors, equipment, noise, smells, stresses me out. I used to work in a hospital and I find them ugly, smelly and sterile places to be so not exactly the place I want to be for this private, natural and spiritual marathon/endurance event. Plus I don’t see birth as a primarily medical event (mainly as I am fit healthy and low risk), its a natural one that women have done for many many years. Eco-friendly nappies – Ideally, I am going to go for reusable ones but I have also found some disposable one that biodegrades in 6 years (Baby spice also founded the company…..total Spice Girls fangirl here!). I wasn’t convinced of the whole reusable nappy thing due to the amount of energy and chemicals used to wash and dry them, but learning more and more about how much nappies fill our landfill honestly makes me sad. I am responsible for the land that my children will live in and I can ignore that, no matter how much I want to. ALSO, I learned about how much crap is in disposable nappies – so many nasty chemicals that basically just sit on your babies skin from day one. And we absorb the up to 80% of what touches and goes onto our skin so that was the final clincher for me. Hypnobirthing – While I know there is lots I cant control about birth there are things I can do to prepare for this endurance event. So like an athlete I am taking my ‘birth training’ as seriously as I took my half marathon training. While I am adopting different training approaches I knew that hypnobirthing could be helpful in training my brain and breathing and so far it’s been great! Placenta encapsulation – I have found a lady who is trained to do this, managed to convince Joe that it is NOT something he will want to do himself (to save us money of course!) and feel very sure on wanting this done. There is no scientific research backing this up, so its an intuitive decision. Creating a 5th Trimester plan of action – I might write about this in a separate blog but I have been reading more and more about the importance of deep nourishment and recovery in the (what I call) the 5th trimester (most other people call it the 4th trimester but I see the 3 month prior to conception as the 1st trimester). I haven’t spent much time prepping baby clothes, thinking about a baby shower (I totally forgot about this but thankfully my sisters are on it!) or event thinking a lot about the birth. I have been focusing on the 90-day post party and what systems can I set up to ensure I am fully nourished – mind body spirit and soul. I have started to create a postpartum plan of action that will go up on the fridge and talked to my husband about it, found a local specialist in breastfeeding, pelvic floor, pilates, herbs and more in case I want or need their support. Yay, I have been able to do some exercise again! Albeit limited due to hip back and pelvic pain but it still good. walking – at the field near me almost daily (weather depending), I can’t walk far but I still try to do something. squats and push-ups – I do these against/with the kitchen worktop and feels good to move. Have a babymoon! We went to Turkey for our first packaged all inclusive, adult only holiday – IT WAS AWESOME! Tart cherry juice and sparkling water! Great for it anti-inflammatory properties and supporting relation production and feels a bit like Ribena but without any sugary crap or additives! It’s not that I disagree with what people are saying, as I obviously have NO IDEA how I will feel postpartum or when this baby is in my arms. But I hate feeling trapped by other peoples assumptions or values. I want the freedom to navigate this my own way and in my own time and with the space to express my values….and weird hippy choices! So there you have it! And I would love to hear from you – would you like more baby or pregnancy content here on the blog? Let me know in comments below. Are you joining me for my Beat the Bloat Workshop & 5-Day Challenge? We get started too so click below to join us! Great to hear of your and baby’s progress. Wonderful Joe – you are wonderful. If i was pregnant, I’d vwant a man like you. Foot massage, washing up and acceptance plus reassurance. Perfect. I have friends who have used cloth nappies, one for ALL 4 little ones. Do you have a “Nappy library” nearby or one that does it by post (as you’re in Godforsaken Scotland as far as these types of facilities are concerned)? Can be useful to be able to try different brands to find best fit for baby (so various clothficionados tell me!). Keep growing that Mini Joe and nourishing you and him.